Glasgow's Buchanan Galleries has reopened following the death of a man who fell from a balcony. Emergency services were called to the shopping centre at 13:45 on Friday. 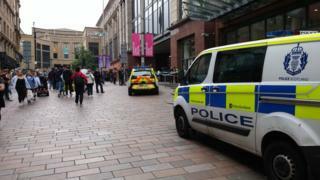 An area at the main entrance in Buchanan Street was cordoned off and a section of the precinct was evacuated. The centre has now re-opened. The man was initially thought to have been seriously injured but Police Scotland later confirmed he had died. An investigation has begun. A Scottish Ambulance Service spokesman said: "We received a call at 1.45pm to attend an incident at the Buchanan Galleries shopping centre in Glasgow. "We dispatched one ambulance, a paramedic response unit, trauma team and manager to the scene. "The first unit was on scene within three minutes."